Arthur’s Quest Slots is a very advanced five reel slots machine that sports three different bonus games. Needless to say but there are a lot of different things going on with this slots. I thought this was a really good thing though because the designers did this while still keeping the basic layout of the machine very simple. I never really got confused with how the bonus games or the special symbols worked and this meant that you could turn the slot on and start enjoying it immediately. The first thing I noticed about this slots machine were the superb bonus features that the designers decided to included. The betting range was absolutely huge as the reels could be spun for as little as a penny or for as much as 225 dollars. This is a range that is sure to make this machine accessible to nearly everyone. There were only nine pay lines included on this machine which wasn’t great but I didn’t think to be too big of a problem as far as the overall winning percentages were concerned because there weren’t a ton of different symbols being used. The symbols on this machine were very solid and I liked the fact that it was really easy to keep track of the various symbol values which really made the game run a lot smoother. The wild symbol offered on Arthur’s Quest Slots was a picture of a sword with the word “wild” going over it. I was really disappointed with this wild symbol. It was available to appeared on every reel but it was only able to substitute for two different symbols, the two other weapon symbols. I thought this was a really bad move by the designers because this really gave a very small role to the wild symbol and I didn’t think it brought as much excitement to the table that it probably should have. While I was playing this game it became really frustrating to see the wild symbol come up time and time again without it resulting in anything. 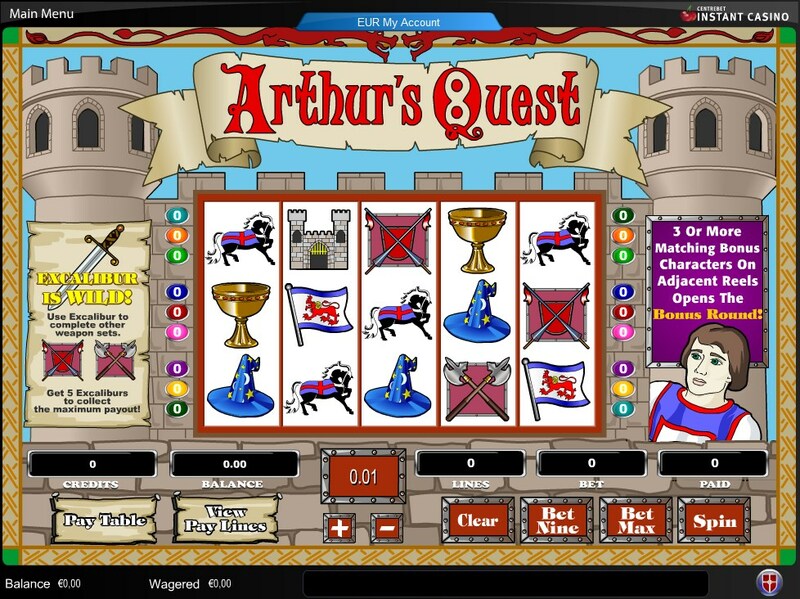 Arthur’s Quest Slots sported three different bonus games that were activated by three different symbols. Each bonus game was activated whenever three or more of the same symbols appeared on consecutive reels. The first bonus symbol was a picture of a really dorky looking knight and it led to a bonus game that involved clicking on various swords stuck in a stone to reveal prize multipliers. The game ended whenever you obtained the “finish” symbols. The next bonus symbol was a picture of Merlin the wizard and this bonus game was very simple. You simply selected one of the four different spells and then received a prize. The last bonus symbol was a picture of a blonde haired queen and this bonus game was even simpler than the last. You simply watch as the frog eat bugs and then awarded you a prize. I wasn’t amazed by any of the bonus games that were included on this machine but I did think they effectively brought a lot of excitement to the overall gaming experience and it felt like I was constantly playing one bonus game or another, which is a good thing. Overall, I thought this was a very solid five reel slots machine. It’s not everyday that you play a slots machine with three different bonus games. This was really the only good thing that the machine had going for it though. I really think they need to rethink how they executed the wild symbol as this was really frustrating. I would suggest this machine to anyone though especially if you have a thing for bonus games.